Raine made her decision known to the public by posting a copy of her statement of withdrawal in her Facebook social media account the same day she filed it to the Commission on Elections (COMELEC) in Puerto Princesa. Judith “Raine” M. Bayron, daughter of incumbent Puerto Princesa City Mayor Lucilo R. Bayron, has officially dropped out of the mayoralty race. 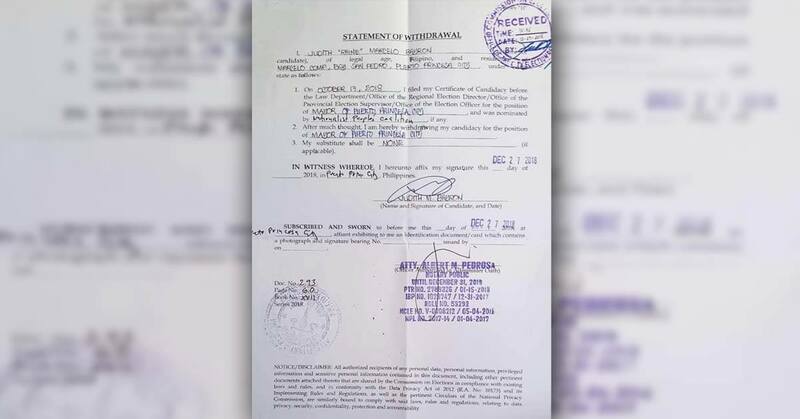 Judith Bayron made her decision Thursday by posting a copy of her statement of withdrawal in her Facebook social media account the same day she filed it at the Commission on Elections (COMELEC) in Puerto Princesa. “Gaya po nang sinabi ko, isang Bayron lamang ang tatakbong mayor (Just like what I had said, only one Bayron will rin for mayor),” her post caption said. Judith Bayron, in a move that left his father’s supporters baffled, filed her certificate of candidacy (COC) to run against him in the mayoralty race on October 17, 2018, under the Nationalist People’s Coalition (NPC). Her withdrawal was despite the fact that the COMELEC is yet to rule on the petitions for nullification of her father’s candidacy from the 2019 midterm polls filed by known critic Jose Maria Mirasol and former mayor Edward S. Hagedorn. City administrator and legal counsel Arnel Pedrosa said Mayor Bayron is confident the petitions filed against him will never hinder his service to the public. “Si Mayor Bayron naman naniniwala na ang puwede lang pumigil sa kanya sa pagtakbong muli ay ‘yong kanyang health issues (Mayor Bayron believes that the only reason that can stop him from running again is his health issues),” Pedrosa told Palawan News also on Thursday. He said Judith Bayron only waited for Mayor Bayron to be cleared from health issues by his doctor before she backed out of the polls. Pedrosa stated Mayor Bayron went to Manila this December for another round of medical examinations and finally received the 100 percent clean health bill affirmation from his doctor. “Actually, inaantay lang rin talaga ni Ms. Raine Bayron na ma-clear ‘yong health issue ng kanyang daddy. Pero ngayong medically cleared [na] siya ay nag-desisyon ang kanilang pamilya at ang Apuradong Administrasyon mismo, ‘yong line up niya, na si Mayor Bayron na talaga ang tatakbo sa posisyong mayor ng Puerto Princesa City (Actually, Ms. Raine Bayron only waited for his father’s clean bill of health. But now that he’s medically-cleared, the family and the Apuradong Administration line up already decided with finality that it’s going to be Mayor Bayron who will run for mayor of Puerto Princesa City),” he said. City COMELEC elections officer Ferdinand Bermejo in a separate interview said Judith Bayron filed five copies of her statement of withdrawal at 12:35 p.m. on Thursday. “Personally ako [ang] nag-receive [ng documents]. Basta nag-withdraw lang siya, [then um]alis na. Immediately after, ii-inform ng elections officer ang COMELEC Law Department of her withdrawal, tapos to follow na ‘yong dalawang [hard] copies ng kanyang statement. Through email ipapadala na kaagad ‘yan doon, tapos siguro ngayong araw din ipapadala namin ‘yong hard copies para bukas matanggap na doon [sa Manila, COMELEC Law Department],” said Bermejo. “Raine was escorted by Atty. Arnel Pedrosa, and city information officer (CIO) Richard Ligad, upon the filing of her statement of withdrawal,” said Bermejo. On the other hand, Pedrosa reiterated Mayor Bayron is confident that the COMELEC Law Department will issue a positive ruling pertaining to his disqualification case. Pedrosa noted too that they will just “cross the bridge when they get there” in case the decision of the COMELEC is not favorable. “Parang contingency pa siya kung mangyayari o hindi, although mangyayari talaga siya [soon ang paglalabas ng COMELEC ng ruling]. Pero hindi natin alam kung ano ‘yong magiging resulta so we will cross the bridge when we get there. Naniniwala naman kami na walang merit [o] hindi meritorious ‘yong dalawang petitions for disqualification na filed against Mayor Bayron,” said Pedrosa.